Please contact us if you need further information or if you would like to buy the product. Thank you! The U-Pointer 2 is a virtual electronic whiteboard that reads the area where the image is being projected, and processes its coordinates. In other words, it can turn physical surfaces into interactive surfaces. As such, the U-Pointer enhances most screen sharing programs and also provides cost-efficiency. 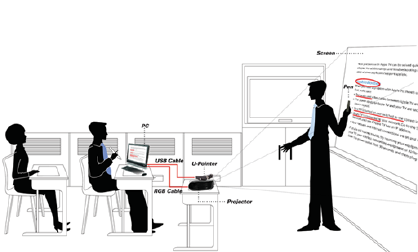 By connecting a projector and a PC to a U-Pointer, any wall or table can be converted into an electronic and interactive virtual whiteboard. Thus, the U-Pointer provides interactivity between the PC and the display. Also, regardless of video equipment, it can be applied to PDP, LCD, larger screens etc. The U-Pointer consists of a special pen for writing on the blackboard, the main component that reads and digitalizes the pen’s coordinates, and a software called i-Pro for the U-Pointer’s hardware. The U-Pointer’s main component has a very small and economical design, and serves to recognize the light’s source generated at the pen’s touch as a coordinate. I-Pro is a powerful board software provided with the U-Pointer for writing on the blackboard. i-Pro 4 supports various functions, including a multi-writing function on the electronic whiteboard, and also an auto-calibration function. In addition, it offers an authoring function to record any lecture notes, writings, videos and audios. Further special functions include a virtual keyboard, a spot light function and a blind function. Copyright by EN-CO Trading Ltd.